The Full Throttle Media team leaves for Africa today to begin filming "Sport Fishing Safari Kenya". This is a multi-week production that will cover a whole lot of territory. We wish everyone the best of luck and pray for mother nature to open her bosom reveal the glory and splendor of this delicious land. A fantastic carnival of sport fishing excitement awaits. Details and updates to follow as we receive them. 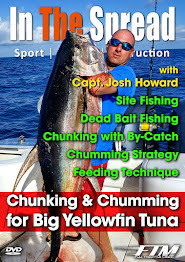 Full Throttle Media would like to extend a special thank you to the sponsors that are giving significant shape to the "Sport Fishing Safari" film series and the instructional series "In the Spread". We see all these companies as making a huge mark on the industry and contributing to the next generation of sport fishing content. For Sport Fishing Safari Kenya, we would like to thank Jasiri Sportfishing in Watamu, Evanes Casino, the East African Whale SharkTrust and the Diani Reef Beach Resort in Diani for providing the project with tremendous contributions. Our team cannot wait to see you soon. For In the Spread, we cannot thank Lindgren-Pitman enough for their generous support and guidance. We look forward to many great adventures together. The production of these projects relies a great deal upon the generosity and commitment of private and public sector partners, so, thank you, to each of our partners. The journey is just beginning.